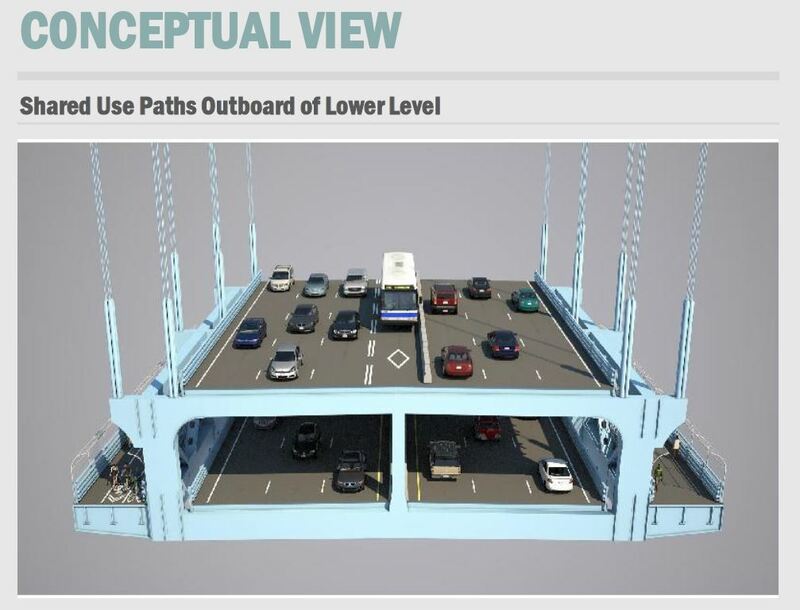 The Metropolitan Transportation Authority (MTA) recently released a preliminary report on its Verrazano-Narrows Bridge Master Plan — including conceptual views of possible shared-use paths on the bridge. The current proposals are much more ambitious than previous bridge path designs, and the costs reflect that – estimated to be between $300 and $400 million. The encouraging part is that the MTA has seemingly put real effort and resources into finally building a walking and bicycling connection between Staten Island and Brooklyn. You can view the entire MTA presentation HERE. Great turnout for the Harbor Ring Rally in Bay Ridge! Over 200 supporters joined us in Bay Ridge to show support for a pedestrian and bicycle path on the Verrazano-Narrows Bridge! 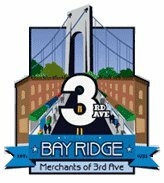 Much thanks to Senator Marty Golden, Councilman Vincent Gentile, the Bay Ridge Merchants of Third Avenue, the Staten Island Athletic Club, the Staten Island Bicycle Association, and the Five Boro Bicycle Club for lending their voices to the cause! 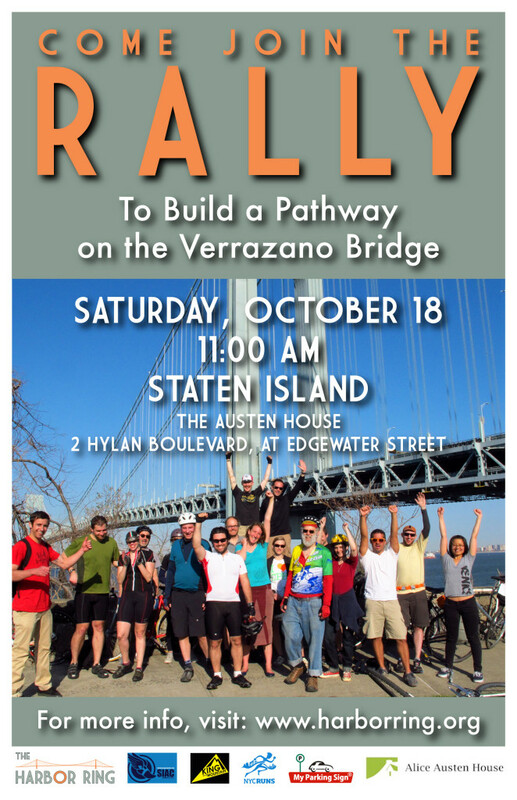 Join the Rally for a Pedestrian & Bicycle Path on the Verrazano-Narrows Bridge on Saturday, Oct. 10th! Since the Verrazano-Narrows Bridge was built over 50 years ago, elected officials and community leaders from both Brooklyn and Staten Island have called for a connecting path for people on foot and on bike. Now, thanks to a current construction project, New York has the chance to make this long-awaited path a reality! 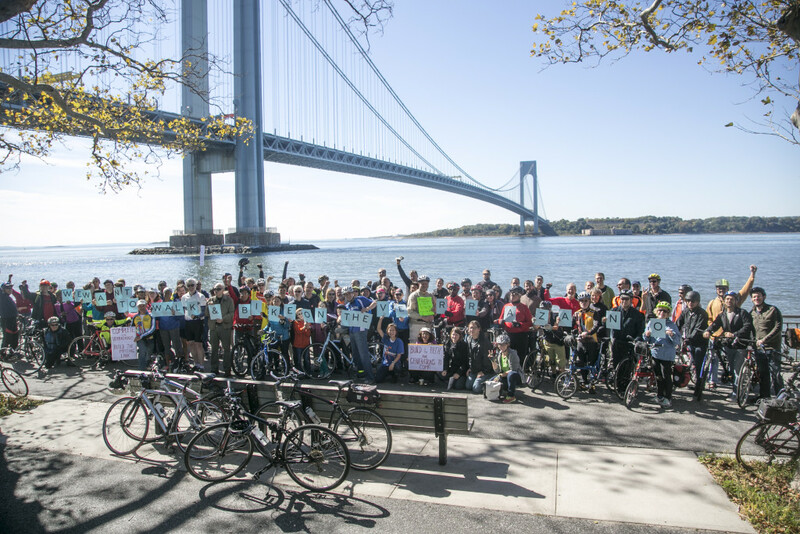 Join Transportation Alternatives, the Harbor Ring Committee, elected officials, and community leaders as we rally in support of building a pedestrian and bicycling path on OUR Verrazano-Narrows Bridge! Full MTA press release is HERE. 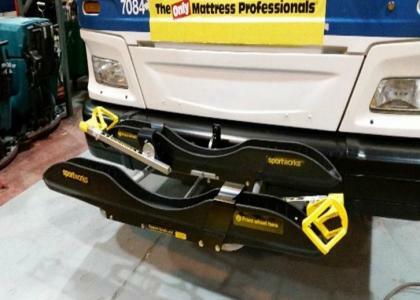 The Harbor Ring applauds the MTA’s efforts to introduce bicycle racks on the S53 & s93 bus routes. It is a welcome addition to the city’s growing infrastructure for both current and future cyclists. We are certain Bike & Ride will be a success, just as similar programs have been in cities all over the country that have long had bike racks as standard equipment across their vehicular fleets. However, one bus carrying two bicycles is by no means a solution for our city’s overwhelming transportation deficiencies. We continue our campaign urging the MTA to create separated bicycle and pedestrian pathways across the Verrazano-Narrows Bridge that would offer toll free connectivity between Brooklyn and Staten Island. Great day for a Harbor Ring rally! 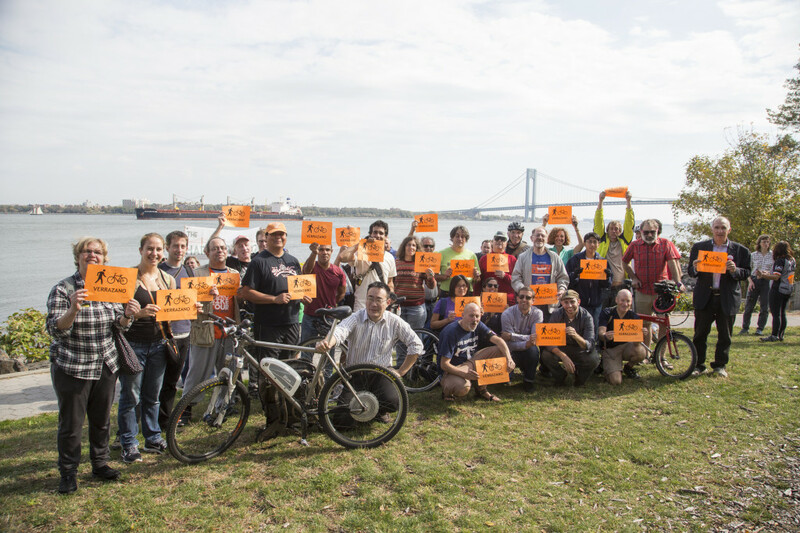 A big thank you to all who attended Saturday’s rally for a Verrazano Bridge pathway! 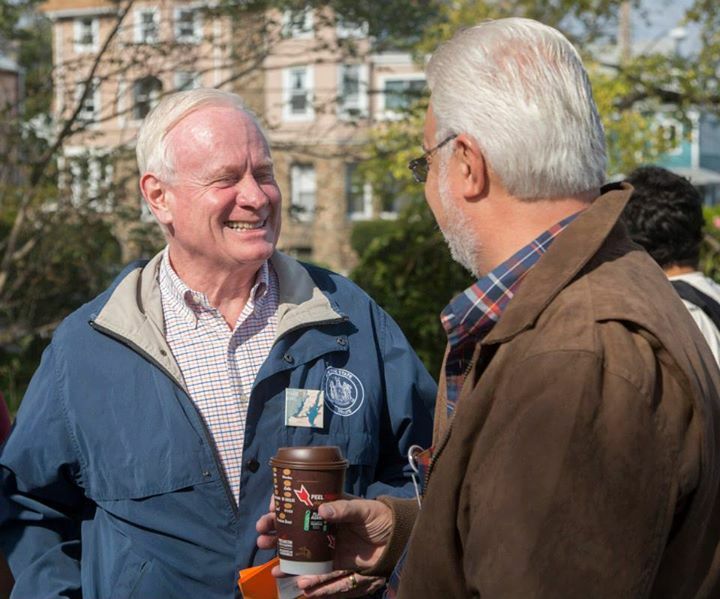 The Harbor Ring welcomed almost 150 advocates to the Alice Austen House on that beautiful October morning. 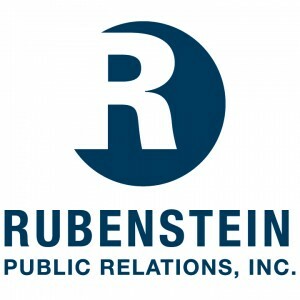 We created quite a buzz the week prior, with press from the New York Times, CBS, and NBC, and grew to over 3,600 signatures on our petition. Check out more at harborring.org/presscoverage! Senator Golden of Bay Ridge gave strong words of support, acknowledging a Verrazano–Narrows Bridge bike/ped path “is long overdue.” MTA Board Member Allen Cappelli echoed the sentiment, declaring, “I believe it is the right thing to do.” Even Assemblymembers Nicole Malliotakis and Joseph Borelli, and Brooklyn Brorough President Eric Adams, who were not able to attend, passed along their words of support for a Verrazano path. And we couldn’t have done it without our awesome volunteers: Linda, John and Roy from the SI Bicycling Association, and John from the T.A. SI Activist Committee! More amazing photos of the day can be found at http://bit.ly/HarborRingRallyPics, and on Twitter under #WalkBikeVerrazano. Video clips are also on our Facebook page. 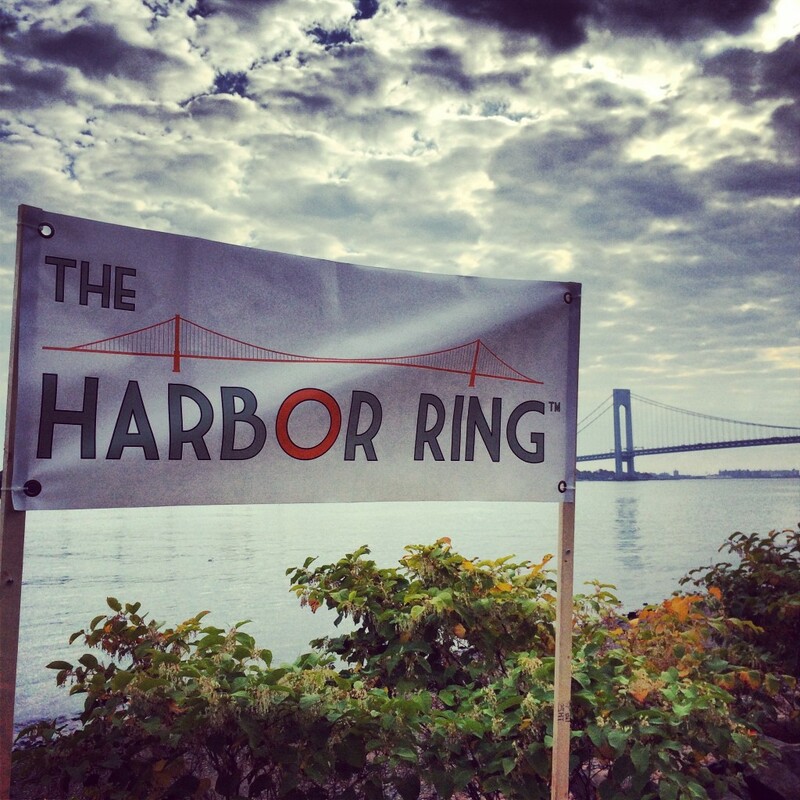 Stay tuned for more ways you can take action and get involved in the Harbor Ring! Thanks again to our awesome advocates, our excellent elected officials and community leaders, and our super supporters for making the Harbor Ring’s rally for a Verrazano Bridge path a success! With your help, we will build this path once and for all! 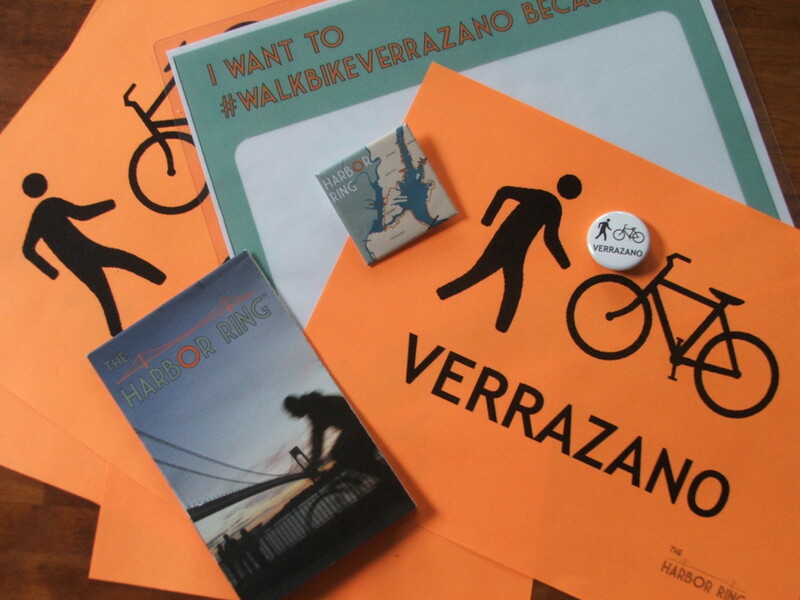 Harbor Ring Rally for Verrazano Path TOMORROW! And above all else, get ready to have a great time! Two weeks left until the Harbor Ring rally! We’re excited! 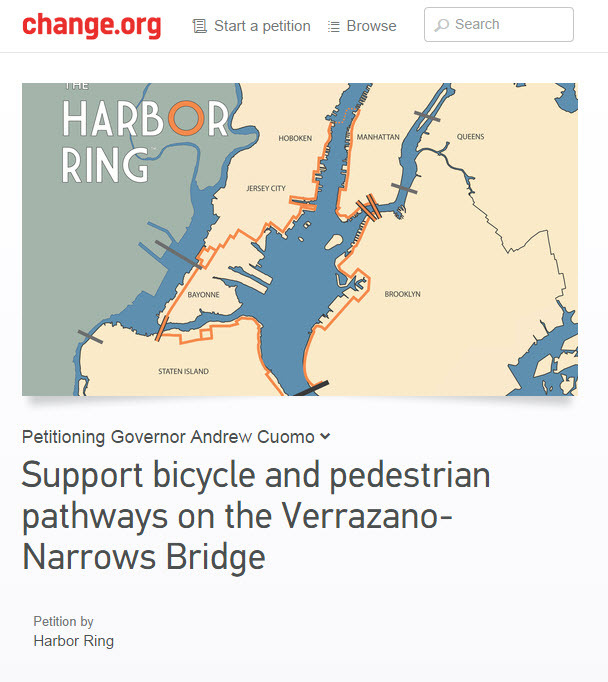 Only two weeks to go until the Harbor Ring’s Oct 18th rally for a bicycle/pedestrian pathway on the Verrazano Bridge, and we’ve already seen a HUGE outpouring of support. Almost 100 people have RSVP‘d, and we’re nearing 3,500 signatures on our petition. Thanks to all who have supported us and the issue–we couldn’t do it without you!